Modern in design. Exceptional in comfort. The Everest Eclipse™does exactly as its name suggests: it eclipses its surroundings. With precision-crafted cabinetry for storage or an optional built in warming drawer, the Everest Eclipse™ brings functional design to a sleek new level. 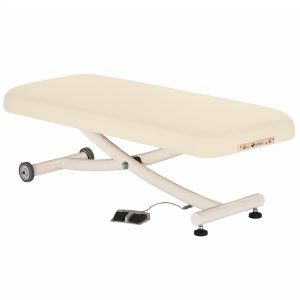 Smooth, quiet height adjustments and ultra-luxurious cushioning offer unparalleled spa-level comfort. In short, it is your multi-purpose solution for every spa need. The Everest Eclipse is custom built to order. Production lead time is 3-4 weeks. 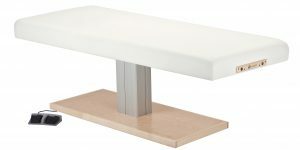 THIS STATIONARY TABLE MUST SHIP BY TRUCK ON PALLET SO THAT IT DOES NOT GET DAMAGED. THIS DOES NOT SHIP FED EX OR UPS GROUND. ALL SHIPPING CHARGES ARE EXTRA,THESE SHIP CHARGES WILL NOT APPEAR ON YOUR INTERNET ORDER BUT WILL APPEAR ON YOUR INVOICE RECEIVED FROM US. 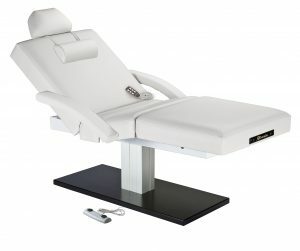 The Everest™ Salon offers resort spa treatment functionality and comfort in a minimalist package. 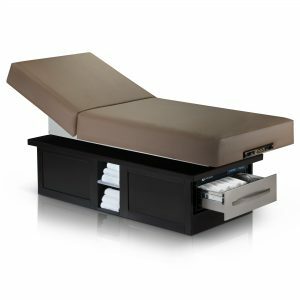 An ideal choice for day spas, medi-spas and resorts, the sleek single pedestal Everest maximizes leg and knee room giving therapists much needed client access while maintaining exceptional strength and stability. The reliable electric lift actuator provides smooth and quiet height adjustments with an easy to use foot pedal. Shown with accessories: Flex Arms, Neck Roll and Head Pillow. 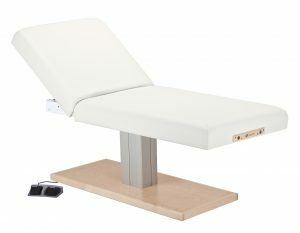 The Everest Spa Pedestal™ Tilt offers resort spa treatment functionality and comfort in a variety of stylish tops and bases to match any décor. 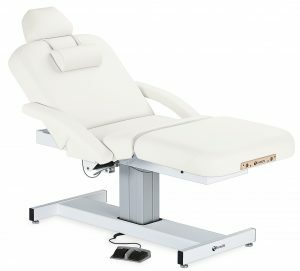 An ideal choice for day spas, resorts the sleek single pedestal Everest tables are designed to maximize leg and knee room giving therapists much needed client access while maintaining exceptional strength and stability. 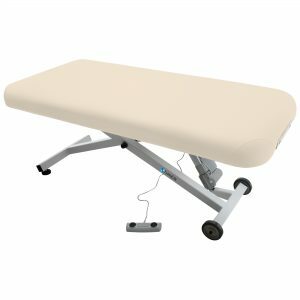 The reliable electric lift actuator provides smooth and quiet height adjustments with an easy to use foot pedal.